A staple in most kitchens, bay (Laurus nobilis) is a familiar herb popular for flavoring soups, stews, stuffing and marinades. But how much do you know about this savory seasoning? Originally from Asia Minor including Turkey and Armenia, this fragrant plant is a broadleaf evergreen also known as sweet bay, bay tree or bay laurel. Because of its popularity and multiple uses, it quickly spread around the Mediterranean and beyond. Bay, along with true laurel, was worn in Greece and Rome as wreaths on the head for protection, as well as an honor for being victorious in sports and battle. Accomplished scholars, diplomats and statesmen could also be crowned with bay wreaths. 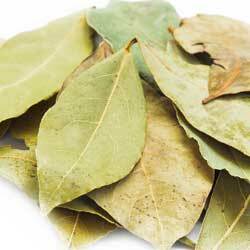 Bay leaves have long been used in flour and grain to keep pantry moths away. Medicinally, it has been used for treating high blood sugar, migraines and bacterial and fungal infections. The oil has been used in bruise and sprain liniments and salves. These evergreen plants can be attractive in the landscape, and have been used as topiaries, hedges and even houseplants. The leaves of bay have the flavoring properties, and may be used fresh, though dried by is most familiar and common. Fresh leaves are less flavorful and milder, but after drying the flavor strengthens. Whole leaves are most commonly used to flavor recipes, but should be removed before serving because the sharp edges of the dried leaves can cause internal cuts if ingested. Bay is easy to grow in pots on the patio or indoors. Give the plant full sun for at least half the day, or keep it indoors in a sunny window. Pick the leaves as needed. Keep the plant pruned to size as it wants to become a tree. To dry bay for future use or to strengthen its flavor, leaves can be dried in a thin layer in the oven or sprigs may be hung upside down in a cool, dark, dry area such as a closet for several weeks until they are completely dry. Dried leaves can retain their flavor for a year or longer if properly stored. Bay is popular to flavor stews, soups, roasts, stuffing, marinades and other savory dishes, and can even be used in teas. But what about a sweet dessert using this versatile leaf? Enjoy a new dish with bay and discover even more about its unique flavor and usefulness today! In small skillet over medium heat, melt the butter and cook until browned, 3-4 minutes. Add the bay leaves and turn in the liquid, then add the lemon & orange juices, brown sugar, bourbon and salt. Simmer the liquid until it has reduced by half and has reached a syrupy consistency, about 5 minutes. Remove the pan from the heat. Add the bananas and black pepper. Stir to coat the bananas evenly. Serve still hot over ice cream.